Get "all-weather" protection at an economical cost. Rite in the Rain all-weather writing paper is perfect for taking notes outdoors in all types of weather. It is specially made for making copies in laser printers and plain-paper copiers. 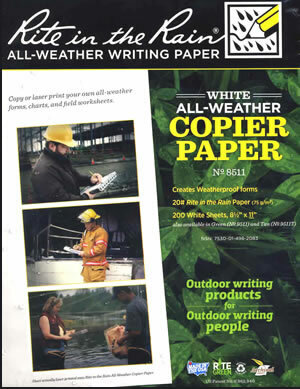 We compared all of the papers that we sell and Rite in the Rain copier paper is the most economical per sheet. It costs about 80% less than DuraCopy and about 70% less than 8 mil iGage Weatherproof. The trade-off is that it is not tear-resistant and does not have the same moisture resistance as a plastic sheet. But it is perfect for light-duty use. Rite in the Rain is a standard paper that has been coated to give it an all-weather writing surface that sheds raindrops and moisture. It is printable on both sides. We recommend writing with a pen with waterproof ink or a mechanical pencil with a hard, broad lead. Lots of people and businesses use this paper to create custom-printed maps, forms, charts or signs for use in the field, laboratory, greenhouse, forest, boat, beach, or just about anywhere a weatherproof paper is needed. It works great for printing topographic maps. Also available as a "military paper" in green and tan colors. 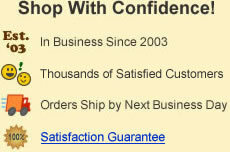 We always have quantities in stock and are ready to ship it to you promptly.